Veterinarians will learn from a nationally and internationally recognized expert on equine lameness while receiving training and professional development in a variety of topic areas involving the care and well being of horses during the College of Veterinary Medicine’s 12th annual J.T. Vaughan Equine Conference Nov. 2-3. Tailored to provide up to 20 continuing education credit units to veterinary practitioners, the conference offers a wealth of information, says Meredith Smildsin, continuing education coordinator at the college. The conference is named in honor of the fifth dean of the college, Dr. J.T. Vaughan, an internationally-respected equine veterinarian, scholar and ambassador. A 1955 DVM graduate, Dr. Vaughan continued his career at Cornell University before returning to Auburn in 1974. In 1977, he was named dean of the college, a position he held until his retirement in 1995. Conference speaker Dr. Vern Dryden grew up on a working cattle ranch in southeast Arizona. His love for horses began at an early age and he graduated at the top of his class from Oklahoma State Farrier School in 1998, becoming a certified journeyman farrier. He used his farrier skills to help support his education at the University of Arizona and graduated as the outstanding senior of the year in Veterinary Science and Microbiology. He attended Washington State University College of Veterinary Medicine, graduating in 2007, and accepted a one-year internship at Rood & Riddle Equine Hospital in surgery and podiatry. He later was offered an associate veterinary position with the hospital and in 2013, became a partner. He has published numerous papers and speaks nationally and internationally on equine lameness and podiatry. In 2015, he opened his own practice, Bur Oak Veterinary & Podiatry Services, and he practices in the states of Kentucky, Florida and Tennessee. 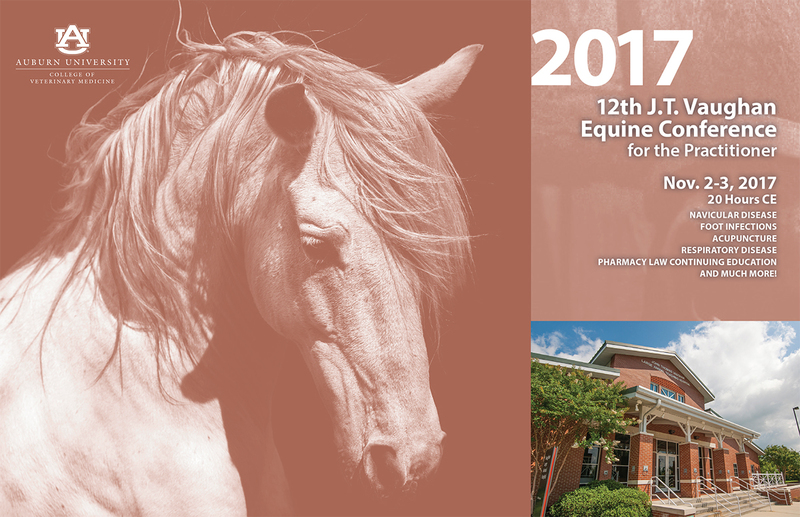 Auburn equine veterinary faculty are teaching the workshops and courses for both days of the conference. Experts and specialists in all areas of equine internal medicine, surgery, emergency and critical care, ambulatory service and theriogenology are scheduled to provide instruction. A complete conference schedule can be found online. On Saturday, Nov. 4, the college will offer a one-day seminar for horse owners, enthusiasts and veterinarians. Registration is $15 and includes lunch and notes. Check-in begins at 8:15 a.m. The workshop will run from 9 a.m.-3 p.m. and will take place in the auditorium at the Wilford and Kate Bailey Small Animal Teaching Hospital. Five hours of continuing education will be available for veterinarians. Read more online.